Rumors continue to swirl around Egypt’s Lagna Al-Khamseen—the fifty-member committee tasked with drafting its new constitution. Speculation is rife as to whether the document will designate Shari’a law as the basis for legislation, allow civilians to be tried by military tribunal, or perhaps destroy freedom of religion. The rumors, opinions, and leaks are unending, and ultimately only those fifty committee members truly know what is going on behind the doors of their closed sessions. The committee has a huge task ahead of it, and only after the new articles have been deliberated, voted upon, and announced will we be able to judge its work. With the final draft of the constitution set to be announced sometime before the end of the year, and parliamentary elections to follow shortly thereafter, let’s take a look at some of the more controversial articles under discussion. The Christians and secularists want to see Article 219 completely removed, and the Salafists and Azhar, to a lesser degree, are adamant that it remains. 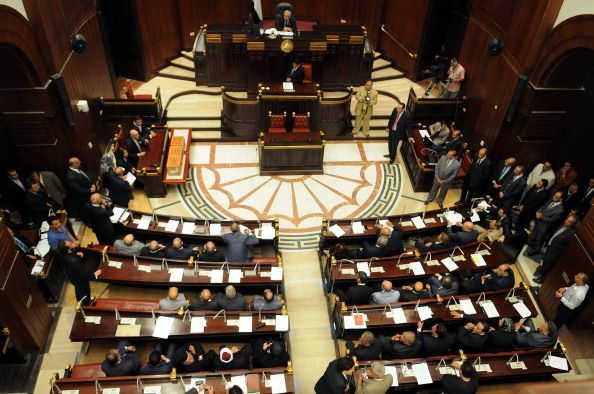 With the Brotherhood absent from the constitution-drafting committee, it is the Al-Nour Party that is left to fly the Islamist flag and try to save as much of the 2012 Islamist-flavored constitution as possible. However there is one proviso. While Article 219 was a complete novelty in 2012, Egyptian constitutions have always included an Article 2, a constitutional article explicitly stating Islam as the state religion, Arabic as the official language, and Shari’a law as the source—sometimes “principal” source—of legislation. This was the case under Sadat and Mubarak. It was also the case under the SCAF and Mursi. It will certainly remain the case under whoever comes next. There are other issues relating to religion and legislation, particularly Article 3 which stipulates that “the canon principles of the People of the Book [Jews, Christians and Muslims] are the main source of legislation for their [respective] personal status laws, religious affairs and the selection of their spiritual leaders.” The term “People of the Book” is considered offensive by some Christians and Jews in Egypt, so the churches want this changed to “non-Muslims.” The Muslims would, at best, agree to see it changed to “Muslims, Christians, and Jews.” If such a straightforward constitutional article can be the subject of heated debate, how can the committee members, representing Egypt’s Muslims and Christians, secularists and Islamists, seek to reach a consensus on anything? The Arab Republic of Egypt has had at least six different constitutions since 1956. While it is true that no two constitutions are likely to differ as much as the one drafted into law by Islamist president Mohamed Mursi and the one that will be drafted into law by those who ousted him, we are still talking relatively minor changes. The term “constitution” evokes epic imagery in the modern English vernacular, bringing to mind grim-faced patriots debating philosophical issues of the highest order. The problem is that there is nobody like Thomas Jefferson or John Adams in Egypt’s Lagna Al-Khamseen, and the document its members emerge with will not be worth the paper it is written on unless Egypt has a government that seeks to implement its articles. Loopholes that allowed mass arrests, the outlawing of political groups, and a state of emergency that lasted for thirty years will most likely survive in one form or another. The only thing that can change is a general shift in society and among the authorities against these practices. While a bad constitution can ruin a country, a good constitution does not necessarily guarantee success. A constitution can only reflect principles already found in society; if society does not believe in the principles of democracy and religious freedoms, then guaranteeing these in the constitution can only do so much. Egypt must look to instill these principles, not just talk about them.